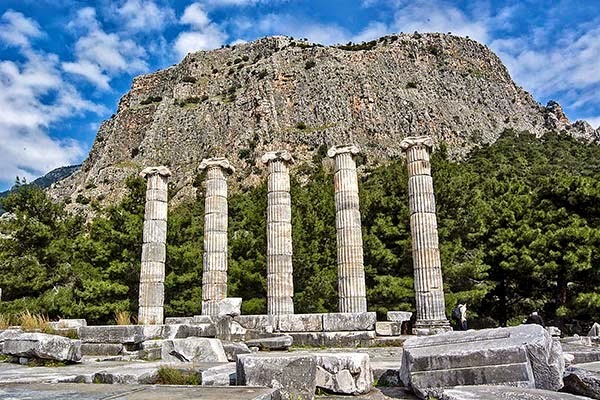 How is Priene connected to Architecture? 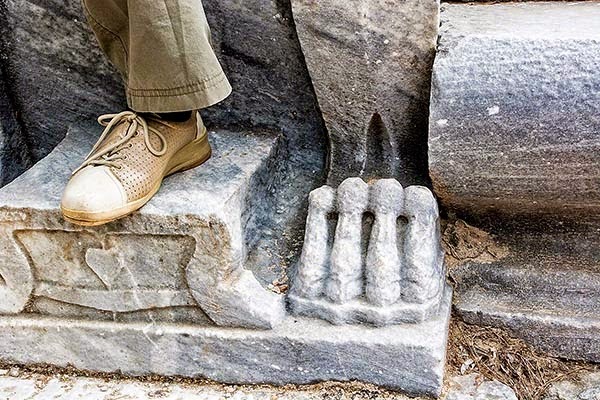 Is Priene this worth visiting? 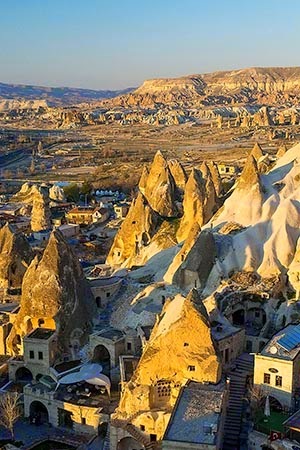 Well, it is if you want to learn about its connection to the Acropolis in Athens or indeed all classical architecture. Priene also has a beautiful setting. 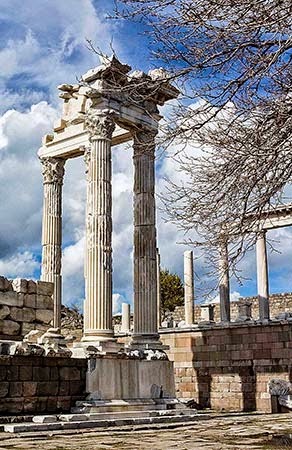 Day 10A: From Selçuk we did a day trip to the ancient ruins of Priene, Miletus and Didyma. Alternatively, you could visit a scenic lake, Bafa Golu. Click on one of the Priene photos once to see a larger view in a slide show. Priene has a beautiful setting on a hill overlooking the cotton fields. All those fields below the hill were once the Aegean Sea! 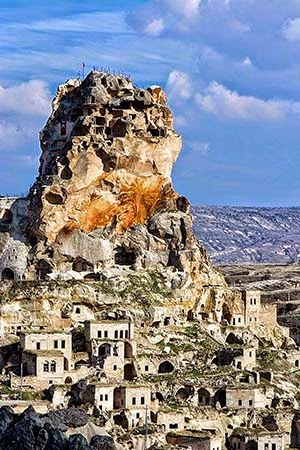 The valley was filled in by the ever-shifting Menderes River from which our word meander is derived. The Romans had to abandon this site because the harbour had silted up. 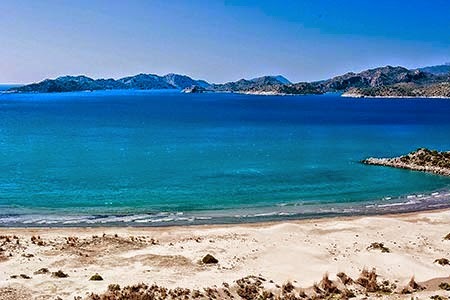 The sea is now 6 km away and, as shown in this map, the bay became a lake – Bafa Golu!!! The small but well-preserved theatre was delightful. It has five armchair seats, with lion paws on each side. 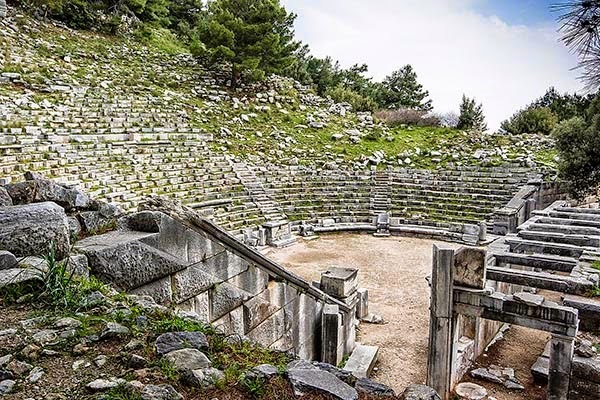 Originally built in the 4th century BC by the Greeks, the Priene theatre was expanded by the Romans in the 2nd century CE to hold 6,000 spectators. 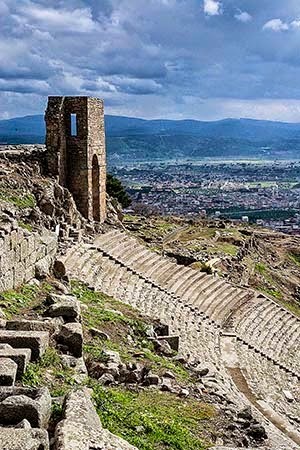 This is a good place to see the skênê of ancient Greek theatres, which is missing at the great theatre in Ephesus. The skênê was the building behind the stage used for scene and costume changing (skênê is the origin of the English word “scene”). 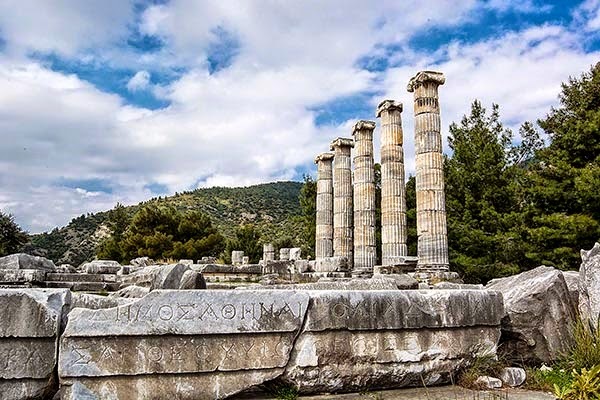 Priene’s main temple, Athena Polias, was dedicated in 334 BC by Alexander the Great, who stayed here during his lengthy siege of Miletus. 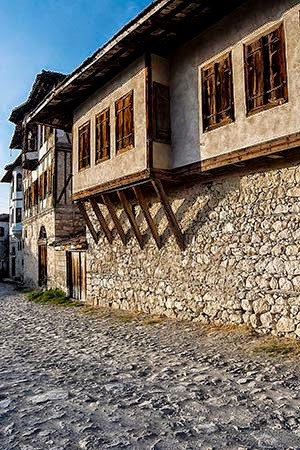 It was designed by Pytheos, the architect of Halicarnassus, one of the Seven Wonders of the World, and located in today’s city of Bodrum in Turkey. The statue inside was a copy of the famous Athena of Phidias in the Athenian Parthenon. No that’s not the connection I mentioned before. Five columns (from the original 66) still stand against the backdrop of a huge cliff, Mount Mycale. These are Ionic columns, one of the three orders of classical architecture. The columns have a little bulge (entasis) to make them appear straight. 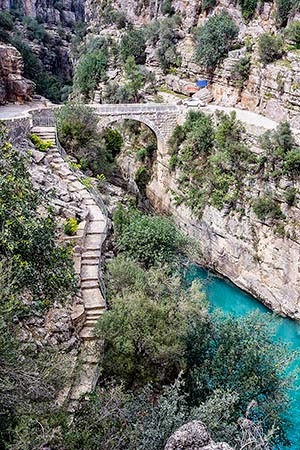 I always imagined that Ionia was somewhere in Greece. But this area of Turkey from the Island of Chios to Miletus is Ionia. 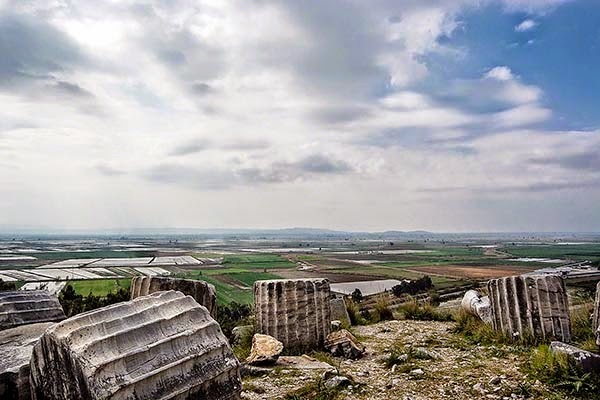 In 479 BC, Mycale was the site of one of the two major battles that ended the Persian invasion of Greece. Notice that the writing on the Priene monuments are in Greek. 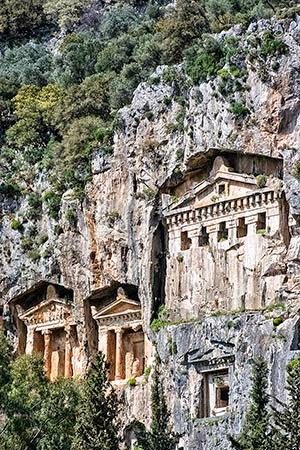 This area invented the Ionic order in the mid-6th century BC. 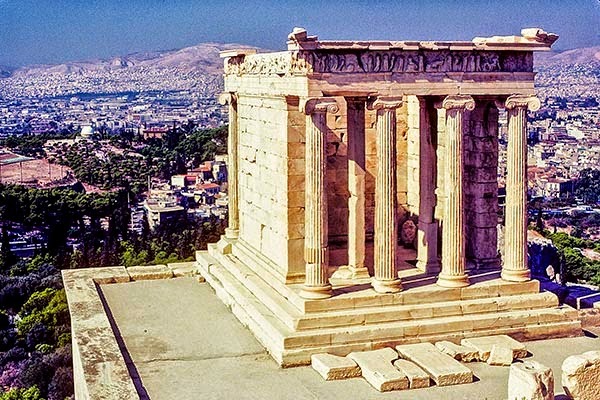 This order sees its supreme expression in the Erechtheion (known for its Porch of the Caryatids) and Temple of Athena Nike on the Athens Acropolis. It is used throughout the classical world and even in modern architecture; such as, the U.S. Capitol and the Jefferson Memorial. Now an even more interesting connection is that Ionic order has an Asian origin: it is similar to columns found at Persepolis (Persia). The Ionic capital is characterized by the use of volutes (spiral scrolls) on top of a fluted shaft. The cap is usually carved with the egg-and-dart pattern. Vitruvius – a very famous architect during the time of Augustus and author of the book De Architectura – describes the Ionic order as showing “more graceful” female body proportions. Did I mention how important Vitruvius was? He in turn influenced future architecture. It was the re-discovery and application of his book by Brunelleschi (c. 1402) that led to the Renaissance of architecture and the Duomo of Florence.